Maurizio Sarri feels he is 'always at risk' of being sacked by Chelsea after watching them succumb to their heaviest defeat in almost 28 years. 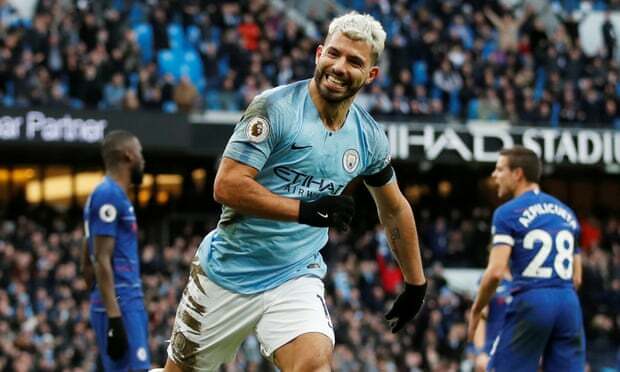 The pressure intensified on the Italian after Sergio Agüero's 11th Premier League hat-trick, Raheem Sterling's double and Ilkay Gundogan's goal wrapped up an incredible 6-0 win for Manchester City. Sergio Agüero’s pageant directed by Manchester City’s Pep GuardiolaBarney Ronay at the Etihad StadiumBarney Ronay Read moreWhat actually happened was a peacock-like spreading of City’s feathers, featuring a four-goal blitz inside the opening 25 minutes, another hat-trick for Sergio Agüero and the feeling, once again, that, if Liverpool can beat this team to the Premier League title, it will rank as the most exceptional performance of any of the championship-winning sides from Anfield through the years.